Thunderstorms disrupted yesterday’s play at Wentworth. 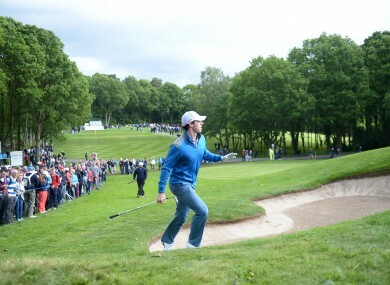 Rory McIlory during day two of the BMW PGA Championship at the Wentworth Club. THOMAS BJORN’S TWO-shot lead remains intact after the final 24 players completed round one of the BMW PGA Championship this morning. Heavy thunderstorms saw delays on Thursday at Wentworth, meaning eight groups were forced to complete their rounds on the second day of the four-day tournament. Bjorn was not one of those and his overnight score of 10 under leaves him with a clear advantage over Offaly native Shane Lowry and Rafael Cabrera-Bello. Oliver Fisher, Chris Doak and Eddie Pepperell all closed their opening rounds with scores of 69 to sit seven shots off the lead, while Jason Levermore and Shiv Kapur are a further stroke back on two under. Ryder Cup winner Edoardo Molinari is one of a clutch of players hoping for improvements on Friday after he carded a three-over 75 that included a double bogey at the 17th and bogey at the last. Email “Bjorn lead not threatened as first round finishes with Shane Lowry flying high”. Feedback on “Bjorn lead not threatened as first round finishes with Shane Lowry flying high”.